Tips for preparing your house--and catsitter--before taking a long trip. Making these advance arrangements will ensure your cats are comfortable and well cared for in your absence. Two of the qualities that make cats wonderful pets are their generally independent nature and ease of care. These traits can also make it easy for your cats to stay at home while you and your family go on a vacation trip, because you do not need to worry about walking them, letting them in and outside, or needing excessive attention otherwise. However, whether you are relying on a professional pet-sitter, family member or a good friend to take care of your cats while you are away, there are a few things you should remember before you go. Taking these precautions and preparatory steps will make sure you can relax while on your trip and not have to worry about those four-pawed friends left at home. Following these recommendations will also ensure that your cats will remain safe, healthy and easy to tend to for your chosen caregiver. All photos on this page are by the author, sockii, unless provided by Amazon. Just because your friend has met your cats before doesn't mean she knows exactly how you want her to take care of them. Arrange a time when she can stop by and you can go through your feeding routine, cat box cleaning care and any medications your cats are on, if necessary. Show her where you store cat food, spare litter, clean food bowls and medicine. If certain cats need to be fed in certain locations in the house, explain and show her where. Cats are very much creatures of habit and it will minimize their stress while you're gone if their routine is followed as closely as possible by the sitter. I like to leave the sitter a written instruction sheet as a checklist, so she can have something to reference while taking care of my cats. While basic cat care may be simple, your cats will grow lonely and anxious if left by themselves for too long - especially if you have only one single cat. Make sure you have someone coming over at least every other day to do litter box duty, change water bowls and refill dry food. Cats who eat wet food should get fresh food every day, and daily visits will help make sure your cats don't get into unexpected trouble or injure themselves without someone there to rescue them, if need be. If you have a security system and decide to leave it on while you are away - a wise choice to make - be sure your cat-sitter knows how to turn it on and off when he enters. Also, if you have any "tricky" or sticky locks in your home, be sure your sitter has been made aware of this and can successfully open (and close) your doors when he enters and leaves. Keep it simple for your sitter by pre-measuring bags of dry food for your cats, especially if any are on restricted diets and you don't want excessive food to go to waste. 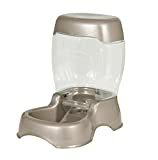 Make stacks of wet food cans, one for each day you will be gone, to make it easier for the sitter to know exactly how much food to put out for your cats. Ensure that your cat-sitter knows how to contact you in case of any emergencies, such as a sick cat or a problem in your home. Leave him your hotel/lodging name and phone number, your cell phone number, and any other local contact information you might have available. Also, you may wish to provide the name and phone number of a friend who lives near your house and has a set of your keys, in case the sitter gets locked out or cannot make it to your home for any reason. Having such a "back-up plan" for your cats' care is always a good idea. Also don't forget to let your cat sitter know which veterinarian or pet hospital has your pets' records and information. If something were to happen while you are away, you want to make sure the sitter can take your cat to someone who has detailed records of any past medical issues, vaccinations and history since you can't be there to answer such questions. Should your cat-sitter need to rush your pet to a veterinarian or buy emergency supplies, it is a good idea to leave her with a small supply of cash for such needs. $100-200 should suffice, in a safe, hidden place you tell her about in advance. You may have an indoor/outdoor cat, but do not assume that he would be fine with being left outside for days or weeks on end without you! If you cannot find a cat-sitter you trust to have access to your house, board your cat at a pet hospital or with a reputable boarding service instead. A beloved pet should not be forced to deal with the elements and scavenge for food, lacking the shelter of home and feeling abandoned. How do you make sure your cats are cared for while you're on vacation? I hire a professional cat sitter. I get a friend, relative or neighbor to take care of them. I put my cat in a boarding facility. I only travel if I can take my cats with me! This is really helpful as leaving our housebound cat while we go on vacation is always a very big deal to me. My cat is very timid and dotes on me especially which makes it very hard to go away for longer spells. I am lucky that my Dad helps out with looking after her and I don't honestly know if I could leave her otherwise since I'd have to trust someone 100%. These are all good tips. We once arranged for friends to come in and take care of our cat while we were gone and didn't go through our routine clearly. The poor cat was terrified and only came out to eat - she got quite fat! Now we have a cat door so our indoor/outdoor cats come and go on their own schedule and the cat sitter just has to show up and feed them. Yes, I only learned that one the hard way when one of my cats developed a medical emergency while I was away a number of years ago. Fortunately I had a good friend taking care of my cat at the time who didn't mind paying the exam fee for my reimbursement later (and the vet hospital arranged to take my credit card for the rest over the phone), but, I wouldn't want to leave things up to chance in the future again. Good Tips! I hadn't thought about the one advising to stash emergency cash, but we do do most of the rest. He has a standing list with special things to do, emergency numbers, etc. I'll be sure to add the extra item to my pre trip to do list now. 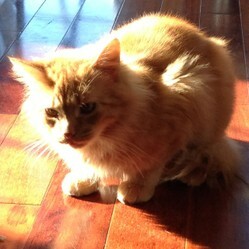 This is the story of finding a feral cat and deciding to bring him home. The view of a long time cat lover on indoor cats and outdoor cats and which kind is best for each environment.